A few years ago we got some perennial leeks online. Like all plants you get online it is difficult to know if it will survive being posted or survive in our garden. They are meant to grow and taste just like ordinary leeks. Instead of saving seed and raising seedlings they grow numerous tiny leeks from their base. When we moved here I dug up the leeks and brought them with us. Normally they keep growing as usual but this summer they seemed to die down to bulbs which made moving easier. I planted them out in one of the vegetable gardens. 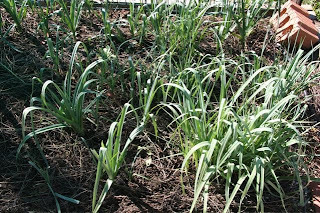 The picture below shows some of the leeks I have planted. Having never eaten or grown any other type of leek I can not compare them, but these are easy to grow and are tasty. They are very productive and take heavy frost with no worries. If they die down when stressed they should also be able to take the heat here. As all leeks apparently do, they grow rather slowly. But these ones multiply fast. I have let some plants flower but they have never produce viable seeds for me. 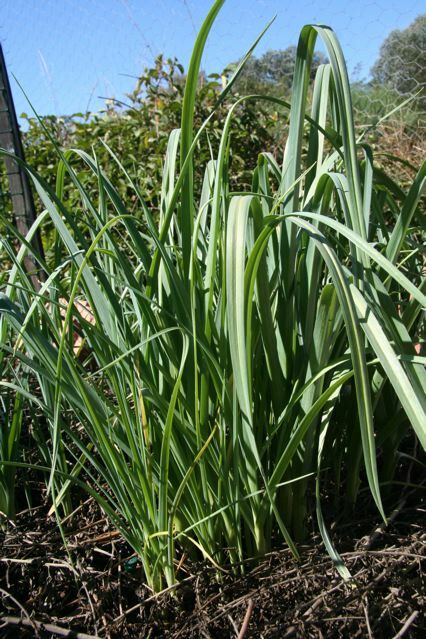 By the time a large leek is ready to be dug up and eaten it will have numerous smaller leeks ready to take its place. If you divide the babies off they all grow large and start to multiply, if you do not divide them they keep growing but are much smaller. The picture below shows a larger leek in the background, with many smaller leeks in the foreground waiting to be divided. As you can see the lack of viable seed is not a problem whatsoever. Like all the vegetables that I have got online I had hoped that these would do well and would eventually pay for themselves in one way or another. Some things have paid for themselves by reducing the amount of groceries we have to buy, others such as yacon pay for themselves by being sold. 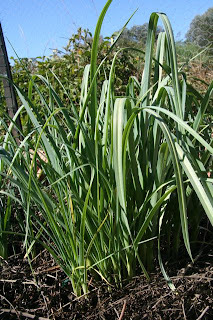 The leeks certainly have been hardy and generous plants and have grown and multiplied well. After seeing the prices for leek in the supermarket I know that they have paid for themselves several times over just from what we have eaten. I do sell perennial leek plants as well as some other perennial vegetables, herbs and some vegetable seeds, please see my For Sale page for details. Scott, I will send you an email. I am not sure if quarantine will let me post them to you as I live in Australia, but I will try to find out. For anyone else, I do sell perennial leeks as well as some other perennial vegetables, herbs as well as some heirloom vegetable seeds.